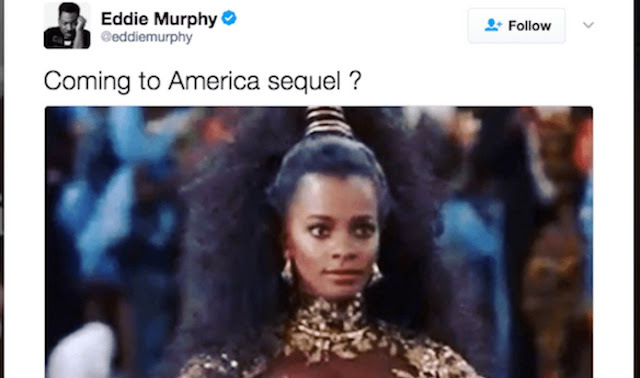 Legendary comedian and actor, Eddie Murphy yesterday sent social media into a frenzy with a cryptic tweet that suggested that his 1988 classic, Coming to America might be getting a sequel. Before he starred in Nutty Professor, Dr Dolittle and Norbit, Eddie Murphy was one of the most controversial and daring comedians in America. Along with his stage shows, Raw and Delirious, Murphy starred in a series of edgy films that definitely do not fit into the 'family' category on Netflix. Coming to America is a classic in so many ways, with various rumours of remakes and sequels doing the rounds over the years. And with everything that's going on with the world at the moment, Eddie Murphy might just have timed this sequel perfectly if it is indeed happening. He has since deleted the tweet. You tease! !